The culmination of the Coast Survey's work in New York Harbor. 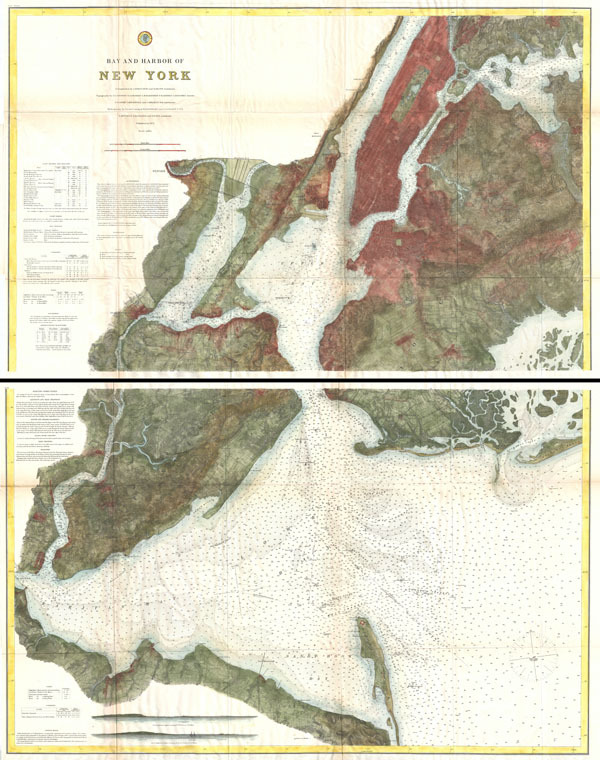 The ultimate U.S Coast Survey chart of New York City, it's harbor, and environs. This nautical chart, dating to 1874, is divided into two parts and is the culmination of the U.S. Coast Survey's mapping of New York City. Assembled, this massive and rare map, measuring roughly 52 x 41 inches, includes much of New York City as we know it today, including Manhattan, Queens, Brooklyn, the Bronx and Staten Island. Also includes Jersey City, Newark and Hoboken. Map offers sumptuous detail throughout, showing city blocks, important buildings, farms and fields, river ways, streams, swamps and topographical details. In addition to inland detail, this chart contains a wealth of practical information for the mariner from depth soundings, to notes on harbors, and navigation tips on important channels. Map also includes tables of light houses and beacons, tides and magnetic declination as well as detailed sailing instructions. The triangulation for this chart was prepared by J. Ferguson and E. Blunt. The topography by H. L. Whiting, S. A. Gilbert, A. M Harrison, F. W. Door, C. Rockwell and J. M E. Chan. The hydrography was accomplished by R. Wainwright and T. A. Craven. The entire production was supervised by A. D. Bache, Superintendent of the Survey of the Coast of the United States and one of the most influential American cartographers of the 19th century. Revised and updated in 1874 under the supervision of C. P. Patterson, Superintendent of the Survey. Report of the Superintendant of the U.S. Coast Survey, (1874 edition). Very good. Minor toning and verso reinforcemnt along original fold lines. Else clean.